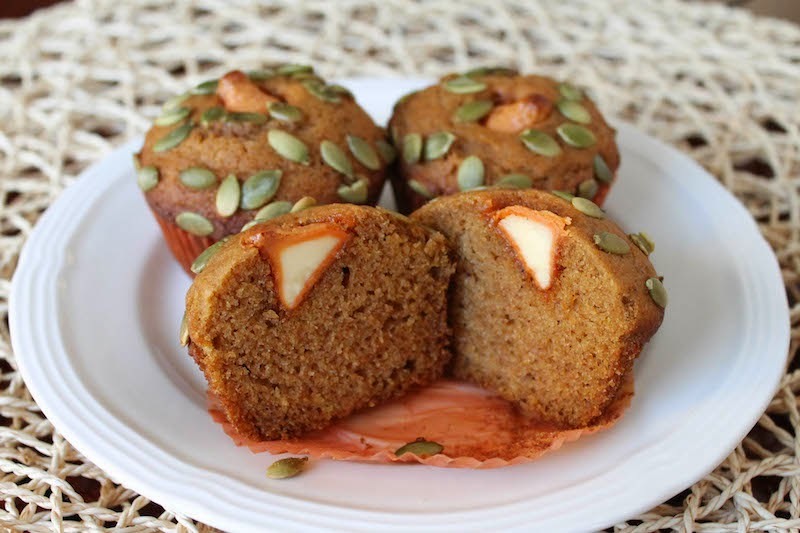 Pure pumpkin puree and cinnamon flavor a fluffy, tender muffin, topped with crunchy pumpkin seeds and a melt-in-your-mouth pumpkin spice white chocolate kiss candy. 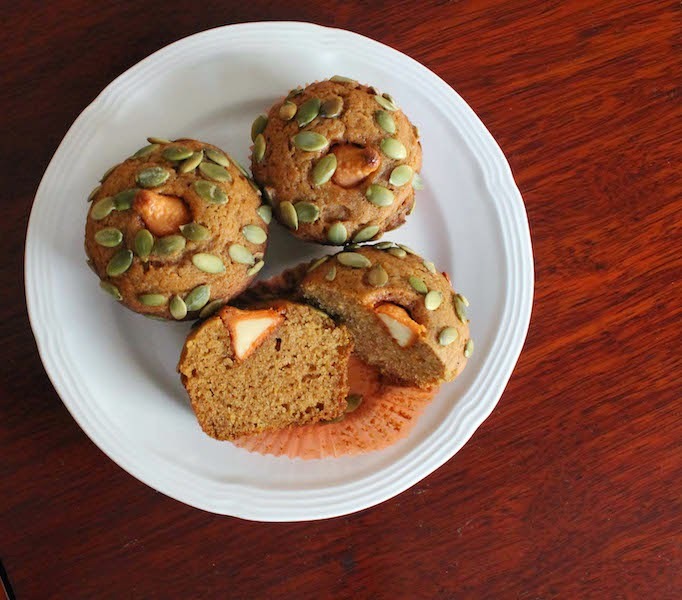 My self-imposed pumpkin moratorium is over. While a chill isn’t exactly in the air yet here in Dubai, I can finally see that there is hope for autumn and soup and pumpkin recipes. It’s been an extended summer of flights to family and friends and even having family visit me. Bless my mother; she came to Dubai in the hottest month to keep me company while my husband traveled on an extended business trip. We did see some sights, the ones that were inside and air-conditioned. Because that is what makes life tolerable when temperatures soar. The top temperature while she was here was, according to my external car thermometer, 52°C or 125.6°F. So, you are going to laugh at me but the current temperature of 34°C or 93°F actually feels cool. I know, weird, right? But it’s true, at least for the first five minutes outside. I am looking forward to the trend continuing. And I am finally baking with pumpkin. Preheat the oven to 350°F or 180°C and either grease your 12-cup muffin pan or line it with paper liners. In one big mixing bowl, whisk together your dry ingredients: flour, sugar, baking soda, baking powder, cinnamon and salt. Set aside. In small mixing bowl, whisk the pumpkin, eggs, oil and vanilla extract. There you have the difference between brands of eggs here. Fold the liquids to the dry mixture, stopping when they are just mixed if you are using all-purpose flour but stirring until completely and thoroughly mixed if you are using the gluten-free flour blend. Divide the batter between your prepared muffins cups. 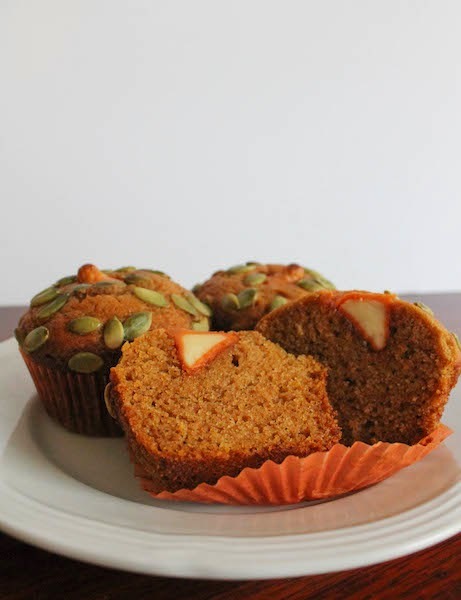 Push one pumpkin spice kiss into each cup and sprinkle the pumpkin seeds all around. Bake for 20-25 minutes or until a toothpick inserted next to the kiss candy comes out clean. Remove from the oven and allow to cool for a few minutes.